Star Wars - Han Solo's "I know." She is addicted to Irish Breakfast tea and chocolate, sometimes taken together. In Tracy Cooper-Posey is an Amazon #1 Best Selling Author. 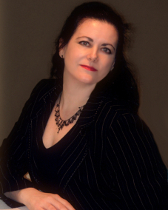 She writes romantic suspense, paranormal, urban fantasy, futuristic and science fiction romances. She has published over 90 novels since 1999, been nominated for five CAPAs including Favourite Author, and won the Emma Darcy Award. To ask Tracy Cooper-Posey questions, please sign up. HI TRACY! I'M FINALLY READING BETH'S ACCEPTANCE. HOW MANY WILL BE IN THE SERIES? There are four novellas already released in the series, and another two scheduled for 2016. I may leave the series open-ended, with the possibility of more to come, but for now, I will stop at six, altogether. Tracy Cooper-Posey It's been a busy year, but I've finally started working on one of the most requested books -- book 4 of the Blood Stone series, called BLOOD REVEALED.…moreIt's been a busy year, but I've finally started working on one of the most requested books -- book 4 of the Blood Stone series, called BLOOD REVEALED. All the major characters from the first three books will be back, along with a few new ones, and opposition to Nial's revolutionaries doesn't just step up the pace, it jumps straight to global proportions. Tracy Cooper-Posey made a comment on Happy 4th to My American Readers!
" It's a very American day for you!
" I'm glad both boys have found homes and families and a stable life. How awful for them! " Tracy Cooper-Posey made a comment on DRAGON KIN now on pre-order at Amazon.
" Janice wrote: "Hope I can special order it in hardcopy format, at Barnes & Noble. Have a great day." It will be available in print format at B& Janice wrote: "Hope I can special order it in hardcopy format, at Barnes & Noble. Have a great day." It will be available in print format at B&N about a week before the ebook release, Janice, so you're good.
" So did I! " Thank you for friending me. Haven't yet found your books at Barnes & Noble, but I'll be looking.I love time travel stories. Hope your Vampires are "good guys/good gals" that protect Humans. Have a great day. Grab your free copy here: http://amzn.to/hcrCCf. - especially now the second book of the series is out! Tell all your friends. (Pass this invite on to them). Tracy, thanks for the add! thanks for accepting my friendship! Hope your week is going well. ~ Lei ~ Reading Is An Adventure ~ wrote: "You're my latest friend :) Don't hesitate to check my shelves and make recommendations." As soon as I get a spare moment, I will. You're my latest friend :) Don't hesitate to check my shelves and make recommendations. Sorry it took me so long. I rarely get over to Goodreads...! Tracy, thank you for the friendship.